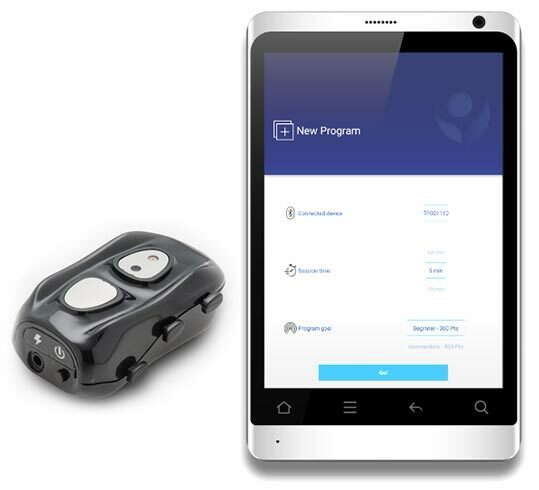 With a compact and light-weight design, the eVu TPS is an elegantly portable sensor that brings biometric data measurement out of the clinic and into your client's smartphone and tablet. Applied to a single finger, the sensor detects and transmits three highly-researched measurements of psychophysiological health: heart rate variability, skin conductance and surface temperature. Data transmission takes place in real time via Bluetooth to the companion app, providing the user with both an accurate and immediate gauge for stress, focus, relaxation and recovery. Included with the eVu TPS sensor is the carrying case, ensuring the sensor is protected wherever it goes in the user's pocket, purse or side bag. When at rest, a healthy heart beat speeds up as you inhale, and slows down as you exhale. These moment-to-moment changes between successive heart beats are a telling measurement of nervous system health in terms of physical, emotional, and mental function. Studies show high heart rate variability is associated with better recovery following exertion, higher resilience to psychophysiological disorders, as well as positive feelings and outlooks on life. Stress, especially when prolonged, decreases heart rate variability. Individuals that suffer from medical or psychiatric conditions like anxiety, fatigue, and hypertension, to name a few, tend to have poor heart rate variability. Training to increase heart rate variability by following slow, relaxed paced breathing decreases the effects of stress on the nervous system, leading to diminished negative psychophysiological issues. Cold hands are not simply due to winter weather, but an indication of the body's response to anxiety and elevated stress. As a response to the pressure of a stressful moment, the body shunts blood flow away from the finger. The logic behind this is that the blood will be needed in more essential systems related to the fight-or-flight response. Repeated and sustained stress can lead the body to maintain the fight-or-flight state, keeping heat-rich blood away from the hands and thereby lowering finger temperature. When the body finally engages the relaxation response, blood flow is allowed to return to the peripheral parts of the hands, results in the warming up of the fingers. Emotional arousal affects the pores on the surface of our skin, which in turn affects the subtle changes in sweating. The measure of conductance across the skin's surface is a telling biosignal for our mental engagement and perception of stress. Frustration, anger and annoyance are illustrated as increases in skin conductance, while contentment, acceptance and clarity show the opposite response. Breathing to de-stress, calm the body, focus the mind, relax and recover have never before been any clearer than with eVu Senz app. Not only does it guide the user with a breathing pacer, but it also scores the body's response to the breathing exercise based on the biometric data transmitted from the eVu TPS sensor. Heart rate variability, skin conductance and temperature metrics expressed as easy-to understand values. System's artifact detection ensures user is informed when movement artifact is present in real time. Appropriate to the needs of any user whether they are novices to paced breathing or experts practicing at their resonant frequencies. Point-based training program that automatically tailors success appropriate to the user's skill level. All training data saved, enabling user and clinician review for effectiveness and compliance. They can be as short at 5 minutes or as long as 60 minutes. From graphics, to music, and points scored.